Students must complete a total of six courses within one year to earn the certificate, including four required courses and two electives. The courses are offered frequently; I don’t foresee a scheduling problem. 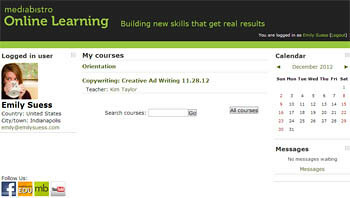 I’m starting off with the 8-week, online Creative Ad Writing Course. It’s Week 1, so there isn’t a whole lot to report yet. But we’ve done the online introduction thing through the dedicated forum, and I can tell you that so far it looks like the class is comprised of 7 women and 1 man. Based on the intros, it looks like my virtual classmates are all professionals with some impressive previous writing and editing experiences — a good sign. Got a product/service you want me to use for my 8-wk ad copywriting course mockups? Chance for some free creative. Tweet me, yo! Week 1 Lesson: This week’s lesson was a lecture from the instructor presented in three parts in video format. The information was solid, and the instructor has more than adequate credentials to present the course. My only complaint at this point has to do with the presentation of the lecture slides. Trying to read them in the video gives me a headache. In lots of cases the text is too tiny to read in the standard video size. Move to full screen, and everything just gets super blurry. An accompanying PDF of the text on the slides would’ve been perfect. Week 1 Assignment: By Tuesday evening I have to choose my product or service, write a creative brief, and select three print ads that I like and three I don’t like and discuss why I like them or not. On Wednesday evening, we’ll all join in an online discussion from 8-9 p.m.
You know, ask me again in 8 weeks. But I will say this: I looked into another online copywriting program last year, and I bailed on it because they were spamming the hell out of me. I never wrote about it (and I won’t name that company here) because I didn’t stick it out. But that company left me feeling like I needed to take a shower every time they emailed me. Mediabistro does online and IRL training. Plus, they already have a solid reputation when it comes to industry events, news and jobs. I’m much more confident in this program, even though I don’t personally know anyone who’s completed it…yet. Got questions for me? Drop them in the comments.